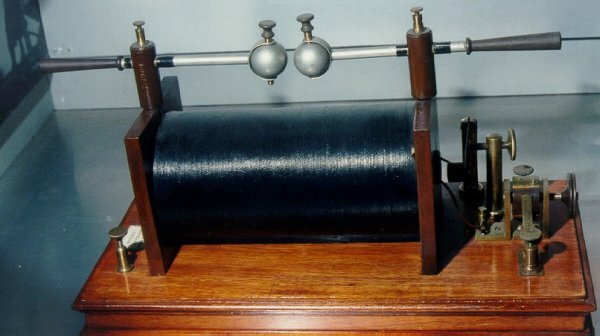 The coherer was the first solid state detector for radio waves. 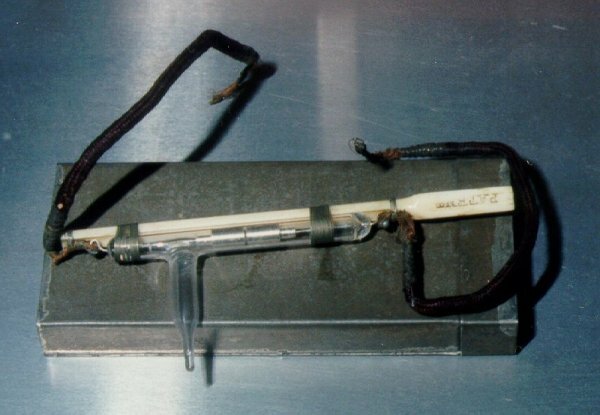 Metal filings were contained in a tube between two contacts. The radio signal caused the filings to "cohere" together and pass a current to a signalling device such as a bell. The coherer had to be tapped to restore the non-conductive state. Electric tappers were developed later to automate the process. This method of generating radio waves was discovered by Heinrich Hertz. A vibrating contact on the right causes a varying current in the primary winding of the induction coil - the large black cylindrical part. A very high voltage is developed in the secondary winding which is connected directly to the balls of the spark gap.